Ask Lovecraft will be back for two performances at the Toronto International Film Festival! Find us at Venue 14 (Duncan and King West) on Sept. 5 from 5-7pm, and on Sept. 6 from 1-3pm! In the Tent space in Artist Alley, behind Honest Ed’s in the Annex. All performances are Pay What You Can. In 2012, H.P. Lovecraft, one of the grandfathers of modern horror, was brought back from the dead by mysterious, unspeakable means. Since then, he has been answering questions and offering advice on the Youtube channel Ask Lovecraft. In almost 300 videos, he has spoken on subjects that range from astronomy to his perception of modern horror and the cinematic adaptations of his work to who would win in a fight, zombies or unicorns? Now, in association with the Toronto Fringe’s AlleyPlays series, we bring Mr. Lovecraft to you live, in the open air of the Tent space at the Fringe Club. He promises to enlighten the audience with both a prepared performance and by providing answers to any queries they may have, big or small. What questions do you dare to ask the Old Man from Providence? Look for Mr. Lovecraft – and the show banner – at the Fringe Club! 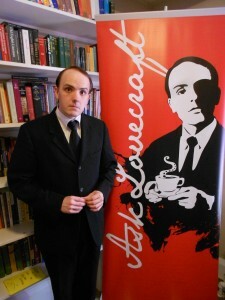 Ask Lovecraft is written and performed by Leeman Kessler. Direction is provided by D.J. Sylvis, and Lisa Sciannella is Stage Manager. 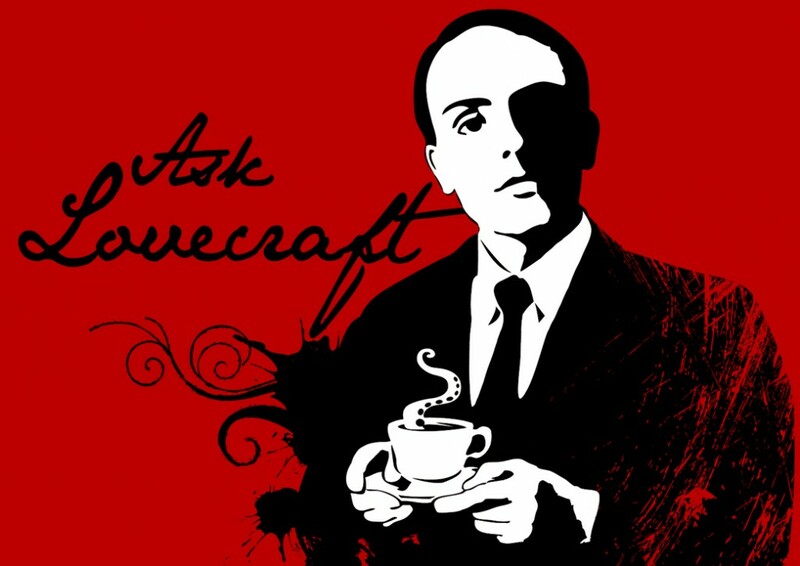 As a bit of a primer for those of you not yet acquainted with the Ask Lovecraft videos, we provide you with something of a ‘Top Ten’ list (though the order is purely chronological). View and enjoy! Of course, this is only a beginning. I’d encourage you to view any and all of Mr. Lovecraft’s videos, and of course I’d hope you’ll come to see him live at the Fringe! Good day! For media inquiries, please email media@monkeymanproductions.com. For a copy of our press release, click here. Ask Lovecraft artwork by Leslie Harker. You are here: Home » Shows » Ask Lovecraft!